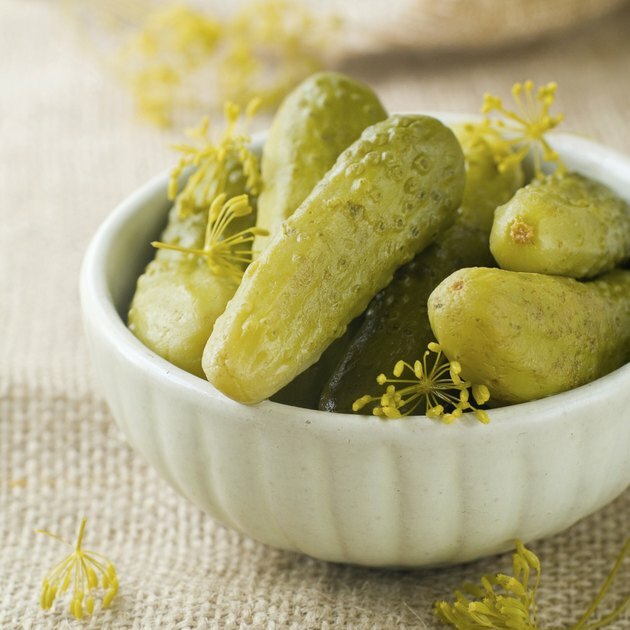 Pickles -- or pickled cucumbers -- make for a delicious snack or garnish. Made by incubating pickles in a brine solution, pickles can vary in flavor -- from dill pickles to sweet pickles. Pickles contain a number of nutrients your body uses to survive: dietary fiber, vitamins and minerals. However, eating large amounts of pickles, or the pickle juice solution of brine, can cause negative side effects. One potential side effect of consuming too many pickles or too much pickle juice is digestive upset. Consuming large amounts of any food can upset your digestive system, causing side effects as your body adapts to the new food, but pickles might prove especially upsetting. They're listed as a food to avoid for diarrhea by the University of Arizona. In addition to diarrhea, you might experience abdominal discomfort or pain, or even flatulence, after consuming too many pickles. Another possible side effect of eating too many pickles is bloating and water retention. Pickles -- especially dill pickles -- contain high amounts of sodium. Your body reacts to this high sodium intake by retaining water to maintain the osmotic balance of your body -- the concentration of salt within your blood plasma and fluids. As a result, you might experience noticeable swelling, especially in your extremities, which might lead to some discomfort. If you experience severe bloating, consult a medical professional about the potential benefits of diuretics to ease your discomfort. Some individuals might experience a temporary spike in blood pressure after consuming a high-salt meal heavy with pickles and pickle juice. Excess fluid retention after sodium consumption can increase the volume of blood plasma in your body, leading to an increase in blood pressure for some individuals, according to the Linus Pauling Institute at Oregon State University. If you already suffer from high blood pressure, or hypertension, or have a family history, avoid consuming large amounts of pickles and pickle juice to avoid excess salt consumption. Consuming large amounts of pickles and pickle juice might also temporarily increase the workload on your kidneys. A primary function of your kidney cells is to act as a filter, keeping nutrients your body needs in your bloodstream while allowing unwanted chemicals to exit your body in your urine. After you consume a high-salt meal, such as pickles and pickle juice, your kidneys must work to remove excess salt from your body to help maintain normal blood volume and pressure. If you suffer from an existing kidney condition, talk to your doctor about the safety of consuming high-salt foods such as pickles and pickle juice.